It's that time of year again! Oxford Dictionary released their "Word of the Year 2015" list with several awkward options. 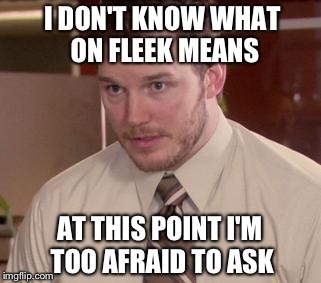 My personal favorite is "fleek." I can't take myself, or anyone else, seriously when this word is used in conversation. "The posts on the Awkward Words Blog are on fleek!" "After primping for two hours straight, Barbie was sure she looked on fleek." "On 21 June 2014, a Vine user called ‘Peaches Monroee’— the online pseudonym of a young American woman named Kayla Newman from the Chicago area—uploaded a video in which she approvingly described her eyebrows as on fleek. Her video went viral and so did the phrase, surging on social media and making its way into the lyrics of songs by the likes of Nicki Minaj. It showed up on Oxford’s monitor corpus for the first time in October 2014, and peaked there just a few months later, in January 2015. That type of steep rise is often followed by a precipitous fall, as a novel slang word loses cachet and is abandoned, but on fleek has continued to register relatively steady use this year, suggesting that English speakers are not yet ready to let it go." Don't worry, Andy, the AWB is here to help!